On this episode of This Olde Fort, we're going to show you how to fix up a Fortress door after your enemies have torn it down. Fortress doors do not behave the same way Keep doors do. They must be built and repaired by the players. If your Fort is missing a door, the first thing you need to do is make sure the Fortress is claimed by an alliance. Once it is claimed, a member guild will need to lay claim to a Gatehouse (above the door). Once this subarea is claimed, a merchant will spawn near the claiming flag. Heavy Wood is used to repair a door. It will take more than one, so load up. If the door is missing, you'll need to purchase a Fortress Door Field Kit. It costs 150 Ordinance (yes, a reason to have those!). 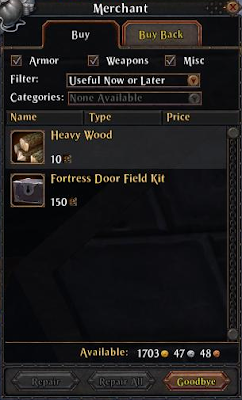 Now that you have a field kit, go over to the open Fort door, click on it, then click on the Field kit. Your door should be closed now. Field Kits and Heavy Wood are not Fortress or Gatehouse specific. So you can buy them anywhere and use them on any Fortress. They do not decay, so you may one to carry around some just in case you need them. We might see another merchant spawn in the inner Fortress. This would remove the requirement of a 2nd claim to purchase repair materials. The Fortress does not have to be claimed in order to use a Field Kit.